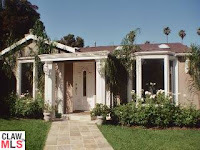 The home at 2202 Camden Avenue, LA CA 90064 received a price reduction this week of 6.79% or $80,000, down to $1,099,000. The home was listed 27 days ago for $1,179,000 and this is the first price reduction of the current listing period. The home has been on and off the market as both a 'for sale by owner' and broker sale since 2007, where they started with an asking price of approx. $1,350,000. According to the MLS, the home is a 3 bedroom / 3 bath, 2,500 sq ft home on a 6,750 sq ft lot. I think the most logical answer to why this house has spent so much time on and off the market has been the asking price for being on the corner of Olympic and Camden.